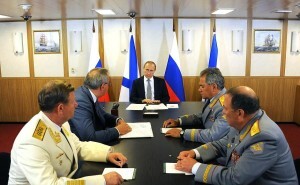 The meeting took place on board the frigate Admiral of the Soviet Navy Gorshkov. Participants included Deputy Prime Minister Dmitry Rogozin, Defence Minister Sergei Shoigu, Commander of the Navy Viktor Chirkov, and Commander of the Western Military District Anatoly Sidorov. We have been updating the Russian Federation’s Marine Doctrine. This very complex document’s main aim is to provide our country with an integral, consistent and effective naval policy that will protect Russia’s interests. The Doctrine has been drafted and approved. This is a big event for our future navy, and for developing our shipbuilding industry, because the main customer – the navy in this case, and the Defence Ministry – formulate their future needs, and the industry must carry out these tasks. Industry adapts to new tasks depending on the needs formulated. Let me note that for the first time, the Doctrine also includes provisions of a purely social nature. They cover marine medicine, and provisions for improving the health of sailors and the specialists working in the marine field. This is very important. People need to know that from now on, our strategic documents for developing our country’s fleet and navy will address the social aspect too, and will give people what they expect from their service, as they carry out the tasks that face our country today in this very complex and important area. Let’s now discuss in more detail the Doctrine’s key provisions. Mr Rogozin, you have the floor. Deputy Prime Minister Dmitry Rogozin: Thank you. This new draft of the Russian Federation Marine Doctrine is a fundamental document of key importance, setting out our country’s naval policy. In other words, it is one of our country’s strategic planning documents. The Russian Government’s Marine Board undertook the document’s drafting, with the navy playing the leading role in this work. In all, 15 federal executive agencies and organisations took part in drafting the new Doctrine. We proposed making changes to the Marine Doctrine adopted back in 2001 for the period through to 2020 for two reasons: above all, the changing international situation; and, of course, strengthening Russia’s position as a sea power. The Marine Doctrine covers four functional areas and six regional areas. The four functional areas are naval activity, marine transport, marine science, and mineral resources development. The six regional areas are the Atlantic, Arctic, Pacific, Caspian, and Indian Ocean, and we have added Antarctica, as a fair number of events involving Antarctica have taken place of late and this region is of considerable interest to Russia. The main focus is on two areas: the Arctic and the Atlantic. The reasons for this are the following. We emphasise the Atlantic because NATO has been developing actively of late and coming closer to our borders, and Russia is of course responding to these developments. The second reason is that Crimea and Sevastopol have been reunited with Russia and we need to take measures for their rapid integration into the national economy. Of course, we are also restoring Russia’s naval presence in the Mediterranean. As for the Arctic, several events motivate our decision. One is the growing importance of the North Sea Route. Mr President, I reported to you that we have begun work on building a new fleet of atomic-powered icebreakers. Three new atomic icebreakers will be ready for work accompanying ships along the northern route in 2017, 2019, and 2020. Furthermore, the Arctic also assures us free and unhindered access to the Atlantic and Pacific oceans. Then there are the riches of the continental shelf, the development of which calls for an attentive approach. The Marine Doctrine pays particular attention to environmental issues too, because it is important for us not only to develop these riches, but also to preserve them for future generations. The Marine Doctrine contains a new section on shipbuilding. This is to a large extent linked to the fact that over these last 10–15 years, we have developed a shipbuilding industry that in terms of naval shipbuilding is doing work on a scale comparable to what was happening during the Soviet period. As for civilian and commercial shipbuilding, we are taking measures to encourage the establishment of private shipbuilding companies, which have demonstrated successful results. State management of marine activities is an important part of the Marine Doctrine. This section stresses the role of the Government’s Marine Board and clarifies the powers of the other state agencies. Essentially, once you approved the Marine Doctrine, we will be able to start drafting the whole list of planning documents for our country’s marine activities in the short, medium and long term. Vladimir Putin: Are there any comments or questions? Let me thank you for this Marine Doctrine’s timely drafting and approval. This is a timely document. It places responsibility on us for its future implementation, and we have already begun this process. Vladimir Putin: Mr Sidorov, what is the situation with coordination between the army and the navy? Commander of the Western Military District Anatoly Sidorov: Mr President, it is hard to talk about coordination when everything works as single whole and unified command. As far as the tasks before us are concerned, the Baltic Fleet is resolving everything together with the Western Military District’s forces. Regarding the delimitation of certain powers between the naval chief command and the Western Military District’s command, there is full coordination in this area.